A villager was reportedly killed and three others injured as fighting broke out between Burmese government forces and the Ta’ang National Liberation Army (TNLA) in northern Shan State’s Namkham Township. 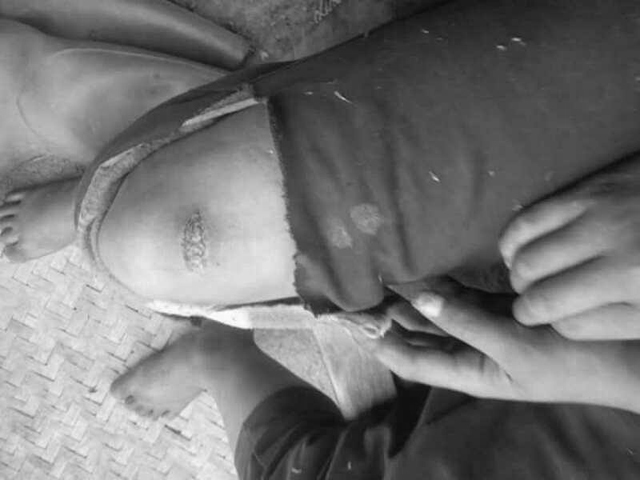 Photo by local source- Villagers were injured during clashes between Burmese government forces and the Ta’ang National Liberation Army (TNLA) in northern Shan State’s Namkham Township. According to a member of a Ta’ang youth group who wished to remain anonymous, heavy weapons were launched around three villages in Namkham Township yesterday. He said that a 75-year-old woman was caught in the crossfire and later pronounced dead at the local hospital. The clash broke out at about 10am on May 2 between Burmese army Infantry Division No. 88 and TNLA’s Battalion No. 571 in the area between Nampakkha tract and Namkham Township, according to a report from the TNLA News and Information Department published on its website on Tuesday. It claimed that the Burmese military launched artillery and deployed three fighter jets over the villages of Namhom, Kongkhur and Pangzarm. Hostilities have been frequent between Burmese armed forces and TNLA troops since 2012, according to Myanmar Peace Monitor, a non-government project under Burma News International’s banner. In 2016 alone, there were 309 clashes reported in northern Shan State – in Naung Cho, Kyaukme, Hsipaw, Kutkai and Namhsan townships. On November 20 last year, the TNLA group and its allies – the Arakan Army (AA), the Kachin Independence Army (KIA), and the Myanmar Nationalities Democratic Alliance Army (MNDAA) – launched coordinated offensives against Burmese military positions in the areas of Muse, Namkham and Kutkai townships, compelling thousands of local residents to flee their homes. The TNLA, also known as the Palaung Army, was among six armed groups excluded by the government from signing the Nationwide Ceasefire Agreement in 2015, during the era of the previous military-backed regime. The Palaung have also been sidelined from negotiations between Naypyidaw and ethnic armed groups hosted by the incumbent government, and headed by Aung San Suu Kyi. The next round of the talks, dubbed the “21st Century Panglong Conference,” is scheduled to take place on May 24, when representatives of the government, military, political parties, ethnic armed groups and civil society are due to discuss the ongoing peace process in the country.